It's always an appropriate time to post this. 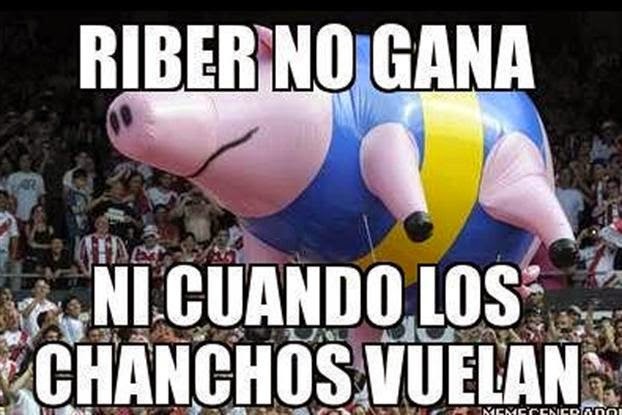 River Plate lost today to Racing, meaning that now River does not control their own destiny. Meanwhile, el Superclasico Sudamericana is on Thursday, where River and Boca Juniors face off in el Monumental (River's home) in the second leg. You'd think that would be advantage River, however Boca will advance to the finals in the case of tie. Unless the game is scoreless, in which case penalties will be taken. In part, River lost today because they played all of their substitutes while resting starters for the Boca game. Reminds me of the spring (autumn in Argentina) 2012 season for Boca. In 1st place for most of the Clausura, making a deep run to the finals of the Copa Libertadores, and also going to the finals of the Copa Argentina. Of course, we lost both finals, and played our subs too many times in the domestic tournament, so we lost that too. Despite obviously having the best team, no championships won.